At Maison d'été, our pure washed linen is soft, elegant and easy to use. It looks great crumpled - there's no need to iron it! You can even put your washed linen comforter cover or pillow cases in the clothes dryer, the linen will become even softer and more beautiful with every wash. This natural material boasts thermal properties that help to control temperature - thus helping you feel just right under your comforter. When it comes to style, be creative! 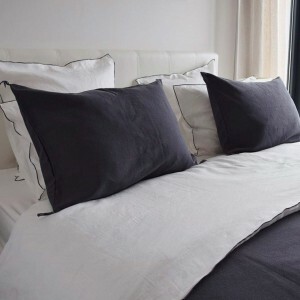 You can mix colors, collections and formats: a white washed linen fitted sheet with a gray comforter cover, and rectangular or square pillow cases: it's up to you to create your own effect! 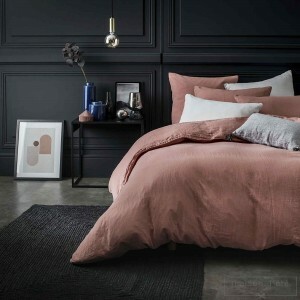 To go with your bed linen, in our Maison d'été online shop you'll find linen and linen gauze curtains, along with linen blinds and brise bises. This beige washed linen comforter cover is very comfortable. Its velvety touch on the skin is an invitation to be relaxed and the "feel-good" vibe at home. This mid grey stone washed linen comforter cover is very comfortable. Its velvety touch on the skin is an invitation to be relaxed and the "feel-good" vibe at home. This Lichen stone washed linen comforter cover is very comfortable. Its velvety touch on the skin is an invitation to be relaxed and the "feel-good" vibe at home. This pink masala stone washed linen comforter cover is very comfortable. Its velvety touch on the skin is an invitation to be relaxed and the "feel-good" vibe at home.